Lindsay Segal and Brielle Buchberg move their vintage and new consignment business to Bucktown. Luxury Garage Sale Not even a year into their business, Lindsay Segal and Brielle Buchberg have moved their shopping operation into a new street-level storefront. 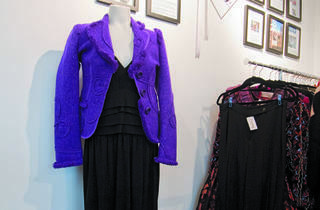 While the bulk of their business remains the same—going to customers’ homes to pick up mostly high-end vintage consignment pieces—they’re offering a few exciting additions: Monday through Friday, shoppers can drop by the storefront to browse a far larger selection of clothing and accessories than what’s available on the ladies’ eBay shop. Plus, it’s not all vintage; a third of the inventory includes deeply discounted overstock from shops around the country. 1656 N Bosworth Ave (773-360-7293, luxurygaragesale.com).